Walk-in absentee voting for the general election begins Tuesday and runs through Nov. 3. Registered voters are allowed to visit any early walk-in voting location in their county to cast their ballot. Star-Advertiser. 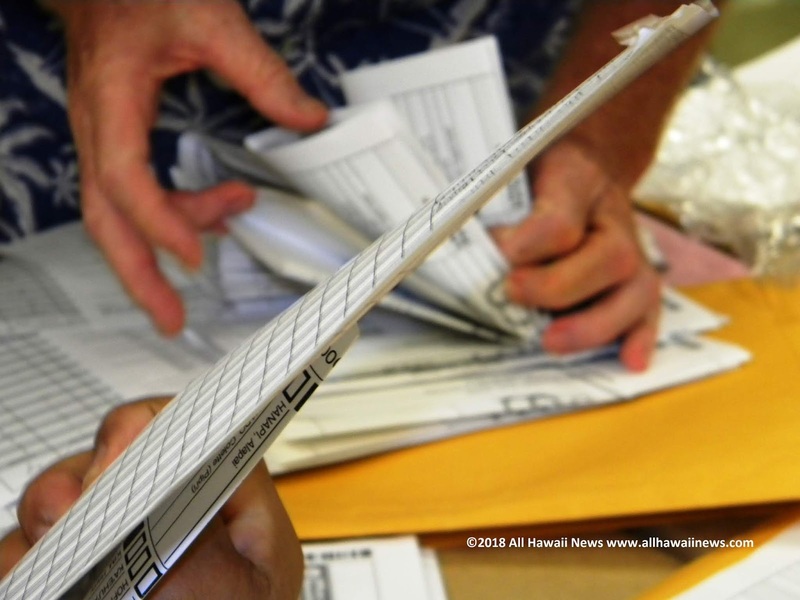 Does Hawaii Need a Constitutional Convention? Every 10 years Hawaii voters are required to decide whether or not to call for a convention to amend the state constitution. A Constitutional Convention, or ConCon, hasn’t happened in Hawaii since 1978. Hawaii Public Radio. The Hawaii Supreme Court on Friday threw off the November ballot a proposed constitutional amendment that would have established a surcharge on investment property to help fund public education. Associated Press. Ed Case and Cam Cavasso bring familiar names to congressional race. Star-Advertiser. Why GOP Congressional Candidate Cam Cavasso Won’t Quit Running. The former legislator hasn’t won an election since 1988, yet he keeps taking on Hawaii’s Democrats in federal races. Civil Beat. Democrat Ed Case and Republican Cam Cavasso squared off with the general election just around the corner. It was a lively showdown between two candidates hoping to earn a seat on Capitol Hill. Hawaii News Now. Who’s Who On The Ballot For The Office Of Hawaiian Affairs. Up for grabs are three OHA at-large seats, as well as seats representing Maui and Oahu. Civil Beat. The contested case hearing alleging ethics violations against Office of Hawaiian Affairs trustee Rowena Akana will start Monday morning despite attempts in court last week to block or delay the proceeding. Star-Advertiser. Hawaii Couple Faces Deportation Of Adopted Sons With Down Syndrome. A federal agency says their parents, Ryan and Francheska Grogan, failed to prove the adoptions met legal requirements. Civil Beat. Marriott, Kyo-ya to meet with hotel workers union over contract negotiations. About 2,700 Hawaii union hotel workers have been on strike since Oct. 8 after negotiating for higher wages, better benefits and job security. Pacific Business News. Time is running out to resolve a series of disputes between the Hawaii State Auditor and staff at the Honolulu rail project, and that time crunch may limit how much the public will learn about what has gone wrong with rail. Star-Advertiser. Former city Deputy Prosecutor Katherine Kealoha is faking an illness to delay her trial next month on multiple counts of bank fraud, according to federal prosecutors. Star-Advertiser. Community and federal government in conflict over opposing plans for Aiea site. The state is trying to fast-track plans to develop a $70 million veterans home mostly funded by the federal government, but a last-minute decision on where to build the facility has created a backlash. Star-Advertiser. Younger patients prefer urgent care clinics, and health care providers are delivering. Star-Advertiser. Ag survey reports nearly $28M in damages caused by eruption. Fewer than 50 Big Island farmers reported nearly $28 million in total agricultural damages in a survey of farmers affected by the Kilauea eruption published last week. Tribune-Herald. Bulldozing begins on Highway 137; temporary road over lava rock to be used by landowners, area residents first. Tribune-Herald. Salary Commission finds setting salaries a tricky business. Among their ranks are a physician, a retired stockbroker, two engineers and a tax manager. Four of the eight are former government employees and one works for a consulting firm doing business with the county. West Hawaii Today. Innergex Renewable Energy wins two Hawaiian Electric solar-plus-storage project bids: Public presentations set for Oct. 29 and Nov. 1 to discuss Waimea project. West Hawaii Today. A series of free presentations planned around the Big Island intend to educate residents and health care professionals about medically assisted death in the “Our Care, Our Choice” Act, which goes into effect Jan. 1. Tribune-Herald. Trashing tires tiresome for county. Hawaii County doesn’t consider tires rubbish, but that hasn’t stopped residents from abandoning them on roadsides or dropping them off at transfer stations in defiance of official policy. West Hawaii Today. Small farm homesteads are planned for a former sugar plantation site. The state Department of Hawaiian Home Lands wants to reduce a backlog of beneficiaries waiting for homesteads by offering a new kind of land lease: small farm sites. Star-Advertiser. Mayoral candidates give preview of administrations. In the lead-up to the Nov. 6 Election Day showdown, mayoral candidates Elle Cochran and Mike Victorino have dished on issues ranging from housing to agriculture to tourism and the economy. Maui News. Hawaii’s only farmer serving as a lawmaker at the state Capitol is questioning Gov. David Ige’s pledge to double local food production by 2020, and Rep. Lynn DeCoite believes legislators should be shifting more taxpayer dollars from tourism into agriculture, which makes up less than 1 percent of the state’s total budget. Maui News. An activity center with ziplines, a giant swing, tightropes and other challenges is being proposed for a portion of the former Experience at Koele Golf Course on Lanai. Maui News. In Kauai Mayor’s Race, Rapozo Faces Uphill Battle Against Kawakami. The County Council chairman looks for a turnaround after being significantly outpolled by the former state representative in the primary. Civil Beat. The Elections Division of the Office of the County Clerk will begin offering late voter registration and early voting services in the basement of the Historic County Annex this week. Garden Island. An abandoned Kauai church that transformed into a gym this June helped youth stay off of drugs and out of trouble; but without the proper permits, the facility had to shut down. Hawaii News Now. And then there were 6. It was feeding time at the predator-proof nesting area on Kauai’s North Shore, but one of the Newell’s shearwater (‘a‘o) chicks didn’t show up for breakfast. Garden Island.